I grew up on stories of great Christians. From saint stories I read with my best friend to missionary biographies my mom read for us to novels based on the lives of great Christians, these stories nourished my faith. So I was very excited about the Torchlighters Heroes of the Faith DVDs. These animated movies present the stories of thirteen great Christians, from St. Perpetua in the third century to Eric Liddell in the twentieth century. 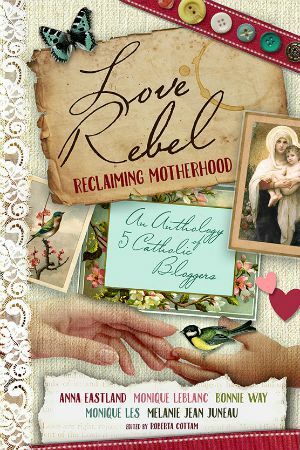 They also include the stories of Gladys Aylward and Amy Carmichael. These women were missionaries to China and India respectively, who rescued hundreds of children. I read their biographies as a teen and connected with their desire to serve God by taking care of children in need. Sunshine and Lily were just as excited as I was about the Torchlighters Heroes of the Faith. They’ve enjoyed other saint stories, so they quickly got into these stories. The Torchlighters DVDs sparked quite a bit of discussion about what each person did and said in the movies. Torchlighters Heroes of the Faith don’t attempt to tell the entire hero’s story. Rather, each Torchlighters DVD focuses on specific, key incidents in their lives. 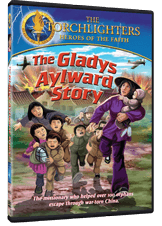 For example, in the Gladys Aylward story, we see Gladys leading 165 orphans away from their small town, which is being attacked by Japanese soldiers. As they walk, Gladys tells the children the story of how she came to be a missionary in China and some anecdotes about her early work in China for the local Mandarin. Eventually, with much prayer, they reach safety in another country. In the Amy Carmichael story, we meet Prina, a young girl who is left at a local temple by her mother, who can no longer care of her because her husband has died. Prina hates the temple and tried repeatedly to escape. Meanwhile, Amy is trying to reach out to the local women, but most are afraid of her pale skin and call her the “soul-snatcher.” Finally, Prina reaches Amy and her story ignites a new passion in Amy, who goes on to rescue many temple girls. 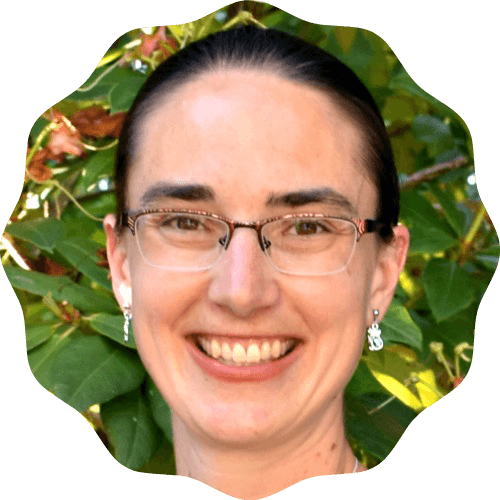 Her work eventually leads to laws against the practice of giving girls to the temples. Some parts of the stories were intense. For example, Perpetua is an early Christian martyr and Corrie ten Boom lived through a Nazi prison camp. I recommend using discretion in watching these DVDs with younger children. Torchlighters Heroes of the Faith are targeted for kids 8-12, though both Sunshine and Lily (ages 7 and 5) watched them. We’ve watched a lot of movies with our girls and assure them during scary movie moments that it always gets better. For these DVDs, I could also assure them that God was taking care of the hero and would make sure everything turned out right. 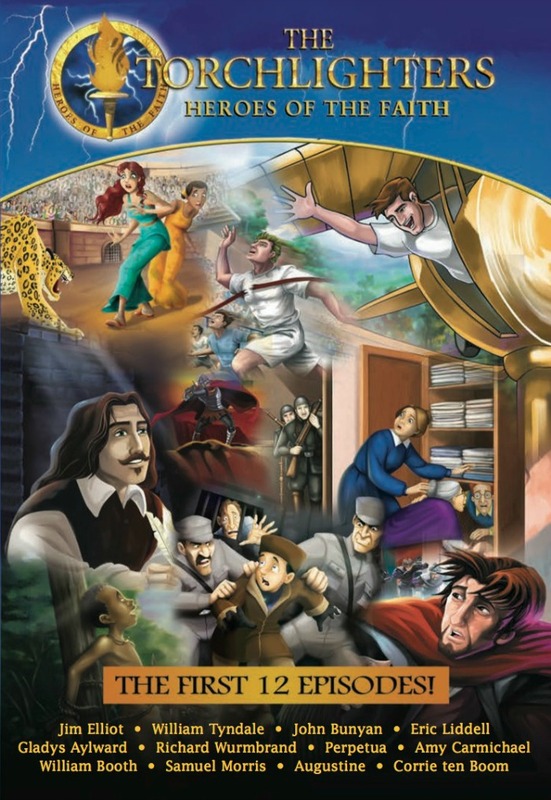 Each DVD includes a 30-minute animated story, four-lesson curriculum in PDF, feature-length documentary of the hero, and English and Spanish languages and subtitles. These would make excellent faith resources for kids in homeschool, Sunday school, or catechism classes. The Torchlighters DVDs began when creator Bill Curtis was reading biographies of great Christian heroes to his 10-year-old daughter. After finishing a chapter about missionary Gladys Aylward, she looked up at her dad and said, “I want to be a missionary when I grow up.” Realizing how clearly the power of this story moved his own child’s heart, the Torchlighters Heroes of the Faith animated series for children was conceived. To find out more about the Torchlighters Heroes of the Faith DVDs or to view trailers for the movies, drop by the website. You can buy individual episodes or the entire set (which I highly recommend). Have your children watched the Torchlighters Heroes of the Faith DVDs? Do you think they would enjoy these stories? I received the Torchlighters 12-pack for the purposes of this review; all opinions expressed are my own.